of Business & Economics in Lisbon, Portugal; the Cornell School of Hotel Administration in Ithaca, New York; and the University of St. Joseph in Macao, taking advantage of the unique areas of industry expertise for each educational institution. Leadership program participation is open to Team Members at a director level and above through nominations by an executive committee at Sands China. The program covered a wide range of high-level topics on the China Market, leadership, and business management aimed at the hospitality, retail, MICE, and entertainment segments that make up the Integrated Resort service industry. The SkillsFuture Earn and Learn Program (SkillsFuture ELP) is a work-learn program that gives Singapore graduates from Polytechnics and the Institute of Technical Education a head-start in careers related to their discipline of study. Marina Bay Sands maintains its partnership with SkillsFuture ELP to help Team Members have rewarding careers and learning experiences. After his internship at the property, Nadaraja decided to continue a full-time career as a management trainee in Guest Services. He enjoyed a wide spectrum of roles within the division, before finding his niche in Concierge Services. 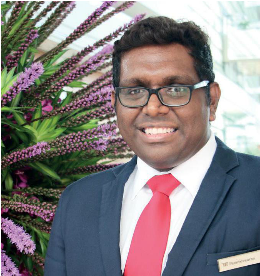 Nadaraja had first learned about Marina Bay Sands while in school, remembering his peers’ enthusiasm for the possibility of pursuing careers at the resort and approached his lecturer for advice. A quick trip to Marina Bay Sands then sealed his decision to take the internship. “The working environment here is fast-paced, and I get to do something new every day,” Nadaraja said. “We are constantly challenged, but our team is like family. We have similar aspirations to grow and excel for our company. With the SkillsFuture ELP, I am one step closer to success as I can constantly upgrade and update my skills to advance. I believe it’s my responsibility to ensure my own competency to move forward. To learn more about CSR programs and initiatives at Las Vegas Sands, view the 2017 Corporate Social Responsibilty Overview.